This is a post for #LetsLunch, a wonderful monthly virtual potluck on Twitter. This month’s theme is a Grandmother’s recipe, in honor of the paperback release of LetsLuncher Pat Tanumihardja’s cookbook, The Asian Grandmothers’ Cookbook. Pat’s cookbook is fabulous– it includes not only a wide variety of home recipes from all over Asia, but also helpful guides to Asian ingredients and cooking techniques. 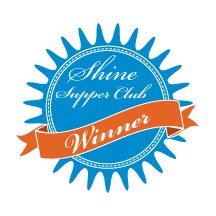 Check out Pat’s blog and her book– we all know the best recipes are handed down by our mothers and grandmothers. I don’t have any recipes from either of my grandmothers, and I am wistful about that. 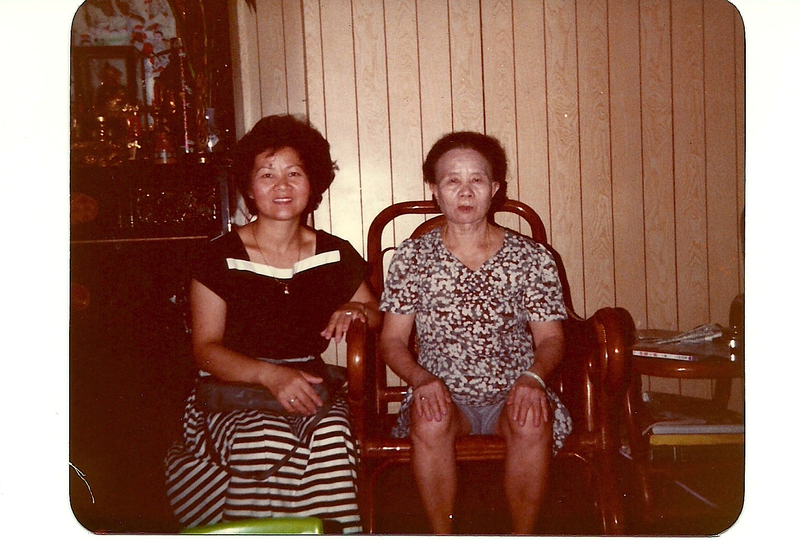 My parents left their homes in Taiwan to attend graduate school in the United States in the ’60s, and our trips back to Taiwan were infrequent. As a result, I grew up without really knowing either of my grandmothers well, and don’t remember their cooking at all. My mother and father each had sisters who were talented cooks and did the bulk of the cooking for their families, but by the time I became more interested in cooking it was too late to ask them to teach me. Taiwanese food is not as well known as other types of Chinese cuisine in the United States, which is mainly Cantonese. With the exception of the San Gabriel Valley near LA, it is difficult to find Taiwanese restaurants even in major Asian enclaves in the States. The ones I have visited have always disappointed me. Admittedly, it’s hard to replicate the exact tastes that make up Taiwanese cuisine: bold flavors which include vinegar, garlic, sesame, soy and other umami flavors, and the texture known as “Q” (chewy/glutinous; you know it when you taste it). These flavors derive from eclectic cultural influences. The majority of Taiwan’s modern population can trace its ancestry to China’s Fujian province, with later arrivals from other parts of China post-1949. The island’s mountain dwelling aborigines are probably responsible for the mad love for eating bamboo shoots and wild greens. Seafood figures prominently, as is natural for an island nation. And other marks were left by previous colonizers from Portugal, Spain, the Netherlands, and Japan. Chronically deprived of the idiosyncratic flavors of my roots, I was on a mission on my trip back to Taiwan this summer. A food mission. I wanted to get a better understanding of Taiwanese cuisine, to try to replicate it at home. I didn’t take any formal cooking classes, but I made it a point to eat a wide variety of Taiwanese food, and to write tasting notes for each dish. I already have a cherished recipe for Taiwanese beef noodle soup, which I inherited from my mom. But other classics– oyster omelet, lo bah bng (pork rice), Taiwanese-style fried rice noodles, wa gui (steamed rice cake in a bowl topped with a garlicky pork sauce)? Even my own mother doesn’t make many of those at home. I have finally learned to make one of the most iconic Taiwanese dishes. This is the Taiwanese oyster omelet (蚵仔煎), pronounced “oh-ah-jen, ” which is a dish beloved to Taiwanese but virtually unknown to anyone else. It’s very popular at night markets. It has many of the elements of Taiwanese tastes I described above: oysters, interesting greens, “Q” from tapioca starch, and a very umami sauce. Shrimp can be substituted for the oysters, if you’re not a fan, and it’s also very good without any seafood. I adapted this from a recipe by Julienne on Taiwanese American.org. While this is not my grandmother’s recipe, I’m hoping it will become a family recipe. Combine all ingredients together in a bowl and set aside. It will thicken as it stands. 1. Stir tapioca starch and water together into a slurry. Set aside. 2. 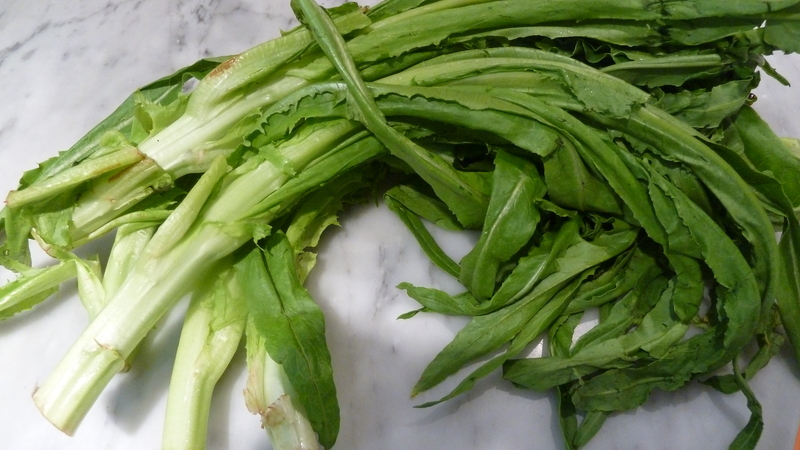 Chop A choy leaves into 1/2 inch pieces and set aside. 3. Beat eggs. The tried and true Taiwanese method is using chopsticks, and you don’t have to fully combine the yolks and whites. Add salt and white pepper. Set aside. 4. Heat oil in a large nonstick frying pan over medium-high heat. 5. 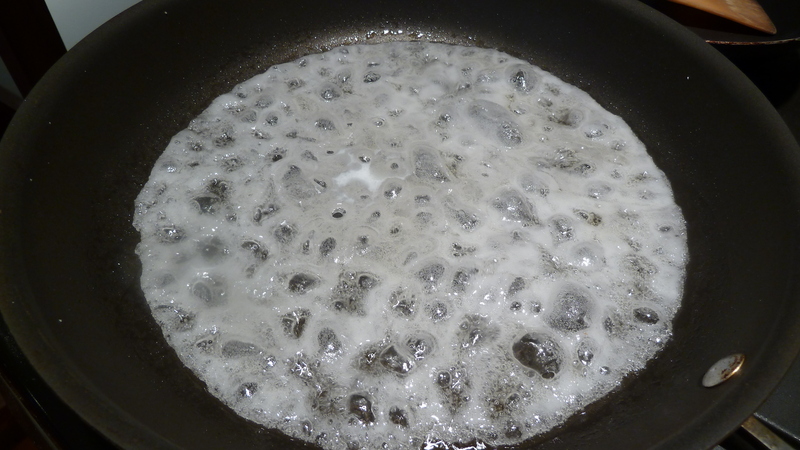 When oil is shimmery, add the tapioca slurry (careful, it may splatter a bit) and reduce heat to medium. Cook for a minute or two until the color changes from white to translucent (kind of like a jellyfish). 6. At this point, reduce heat to low and add beaten eggs. Stir for 10 seconds with chopsticks until coarsely combined. 7. 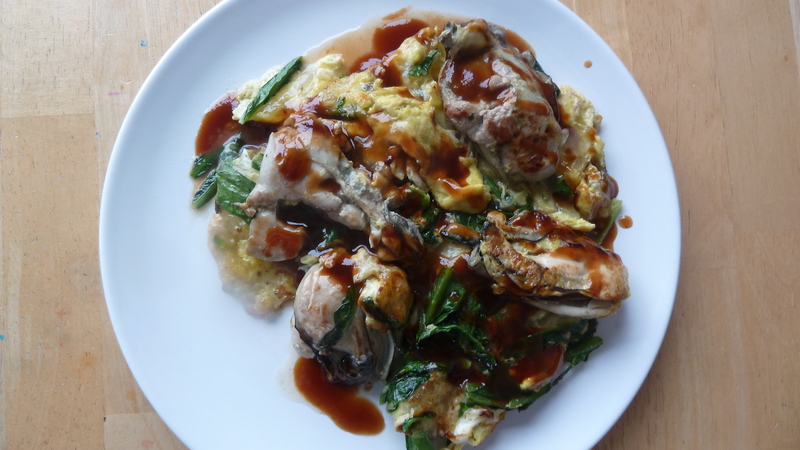 Quickly add oysters and greens on top of eggs and press gently to set. Allow to cook, undisturbed, until slightly golden around the edges. 8. Using two spatulas, carefully flip omelet over in pan. Bring heat back up to medium and allow to cook until oysters are fully cooked and omelet is set, about 5 minutes. 9. Serve omelet on a plate and drizzle desired amount of sauce on top. I’m excited to see what all the other #LetsLunch bunch have brought from their grandmothers. Check back later for an updated list of their posts. We have a similar dish in Singapore that’s popular at the hawker centers called oh luak (I have no idea what the Chinese characters are though!). I’ve never researched its origins but now I will. The chili dipping sauce is made with chilies and vinegar. Yum! I don’t think I’ve had oh luau before but it could certainly be the same dish if it is Hokkien. Let me know what you find out! Wow that looks like an amazing breakfast. Thanks for the stories about Taiwan. I have a friend who grew up in the Fujian province in a town called Liangjiang. He says on a clear day they could see Taiwan when they were walking to and from school. While it’s an omelet, it’s more of a snack later in the day or at night than breakfast, though for Chinese breakfast anything goes! I have never actually cooked with oysters (too chicken to deal with freshness issues in live ones), but this sounds great. I spent a summer in Taiwan during college and I’m a little bummed I missed this dish! Hi Annabelle, I did not know about your Taiwanese connection! 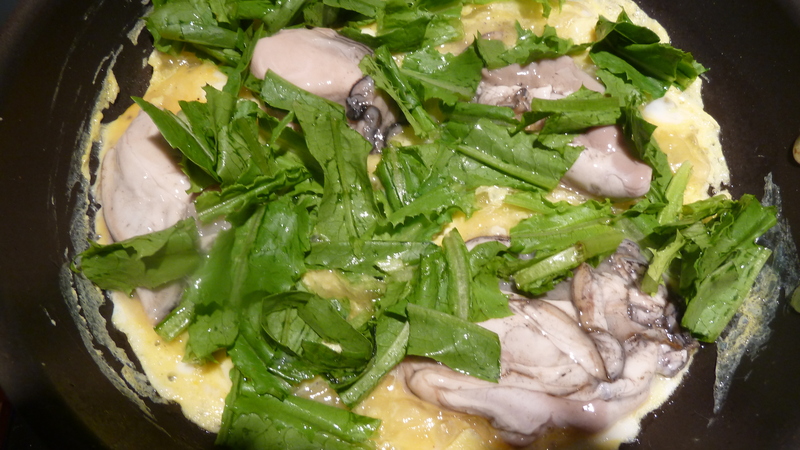 Oyster omelets are actually kind of hard to find– you have to know where to go or ask someone. Hope you like this! Yes, my father grew up in Taichung; I don’t have any close family there any more, but I had a few chances to visit when I was younger. I’ve only spent a few days in Taichung but really liked it– mellow, interesting, and the birthplace of both taiyang bing (flaky pastry suncakes) and bubble tea! Yum, looks great. Kind of reminds me of Korean scallion pancakes with seafood. Hi Es! Similar idea, different taste and texture. What is the starch used in the Korean pancakes? Most people just use regular flour although rice flour is probably better. There’s also bindaetteok, which is made of ground mung beans. Personally, I like pajeon over bindaetteok. You will have to make this for me next time! I’m so hungry looking at the picture. I work in Taiwan and made a video about this legendary dish. Check out my page to see more Taiwanese food and culture videos!